I'm really thrilled to be back to the Murray Building. Like many of my colleagues in the audience, I worked in the Murray Building twice in my public service career, first in the late 1980s, and then almost a decade ago. Somehow I always got this feeling that the beauty and the potential of this wonderful building has not been fully exploited. So, I am very pleased to be back, with this wonderful project completed today. Peter has told you the story after they had won the tender. Let me just tell you the story before that tender was awarded. As I said I always felt that this building still has huge potential, and I believe Central is a place where it still has huge potential, so in 2009 I – of course through hard work of my colleagues and the support of the then Chief Executive – implemented "Conserving Central"(保育中環). If I may I'd just read you something from the preamble to this little leaflet on "Conserving Central". It said that over 150 years, Central, then called the Victoria City, has witnessed and contributed to the transformation of Hong Kong from a fishing village to a trading port and then to a services hub. It now houses Hong Kong's – or China's – international financial centre. It's also a rendezvous point for people from all walks of life. So, in 2009, together with my colleagues, we sat down and tried to rethink about Central. How could we take Central to the next grandeur and newer heights? As a result of that deep thinking, we conceived "Conserving Central". By the way, when I chose a colour for this "Conserving Central" brochure, I didn’t realise it so matches this colour, because Central deserves that sense of taste, class, elegance – and this is slightly like your bronze colour. 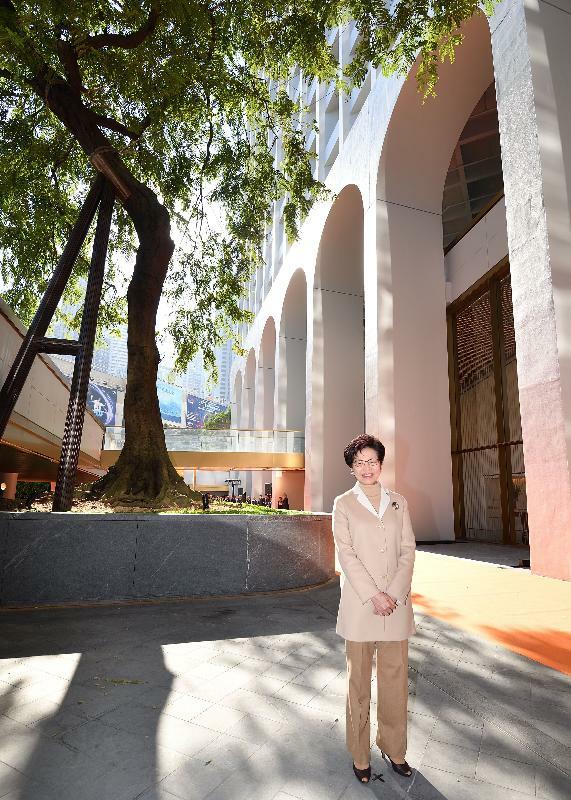 The eight projects in "Conserving Central" are intended to showcase this new Central district to the people of Hong Kong, and to a lot of visitors coming to Hong Kong to work, to play, to enjoy. If I may recap these eight projects – a little bit of advertising as well. These eight projects comprise the Central Harbourfront, which is now a wonderful place for people to get together, to enjoy the summer festival, the arts festival, the Clockenflap music festival and so on. Two projects have already completed. One is the PMQ, from the Former Hollywood Road Police Married Quarters. It's now a design hub for Hong Kong’s young designers. Since its opening it has already attracted 3 million visitors. 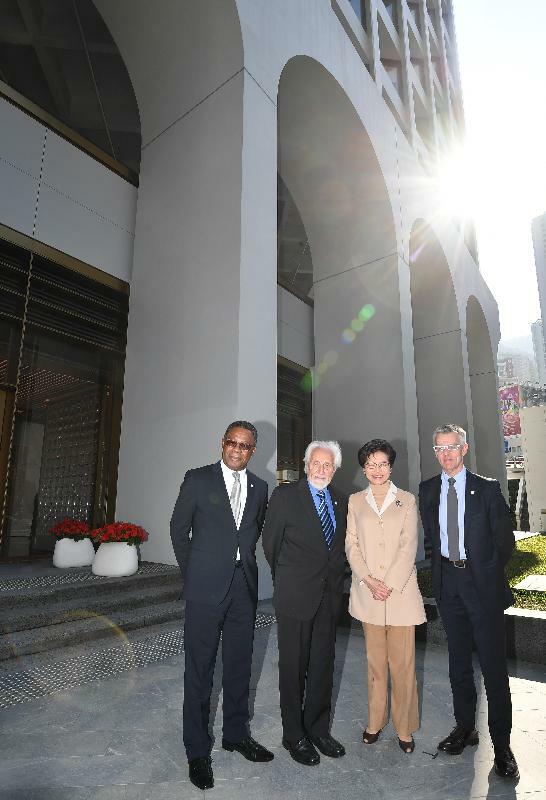 The second project that has been completed, and is connected to this building, is the CGO, the Central Government Offices, which have now been renamed as the Justice Place to showcase the rule of law in Hong Kong, and occupied by the Secretary for Justice and his team. But don’t ask me who is going to be the next Secretary for Justice - today it's still Mr Rimsky Yuen. 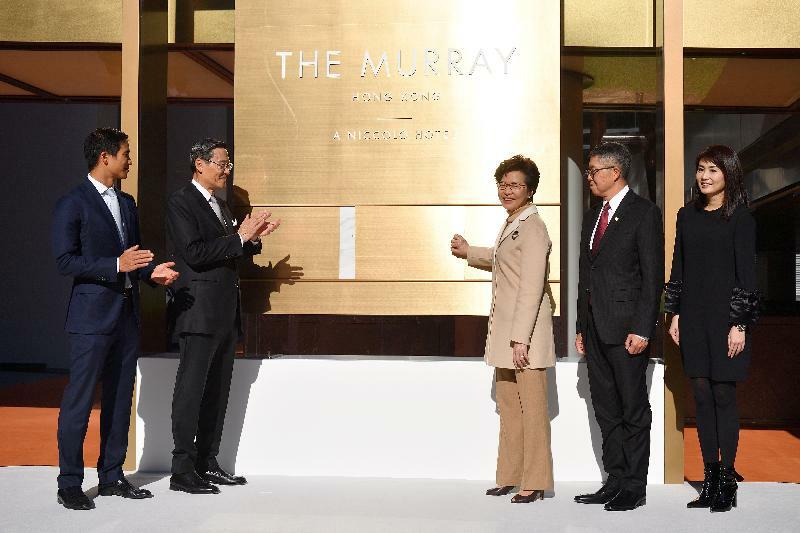 And then this is the third project to be completed, now called The Murray, which is a luxury hotel of 336 rooms. Two other equally wonderful projects are under construction. One is the Tai Kwun, which is Central Police Station Compound, with a cluster of 17 historic buildings. I look forward to opening that Tai Kwun sometime next year, now working very hard by the team at the Hong Kong Jockey Club. The other project under construction is the Former French Missionary Building, a beautiful monument along Battery Path, together with the West Wing of the CGO, and once completed that will enhance Justice Place to turn this whole precinct into a legal hub for Hong Kong. Two projects have yet to go underway, in which I'm a bit disappointed. One is the Sheng Kung Hui compound, but I don't blame the Sheng Kung Hui people because it's a hugely complex project that requires a lot of government approvals. But the final project should actually have been completed a long time ago, which is the rejuvenation of the Central Market, and by the way that is the most difficult decision in "Conserving Central", because that's a multi-billion dollar piece of site in Central that could be turned into a Grade A office tower. I did manage to save Central Market, not only because of the building's history, but also in order to preserve a hangout area for white-collar people working in Central. Somehow it has taken much longer to deliver, but never mind, I'm sure all these other projects will come into place in time to come. Now today, speaking as a new Chief Executive of the Hong Kong SAR, I feel Hong Kong is also – like eight years ago when I conceived this project – at the crossroads. We have just celebrated the 20th anniversary of "One Country, Two Systems" and the reunification with China. But at the same time we are facing a lot of competition. 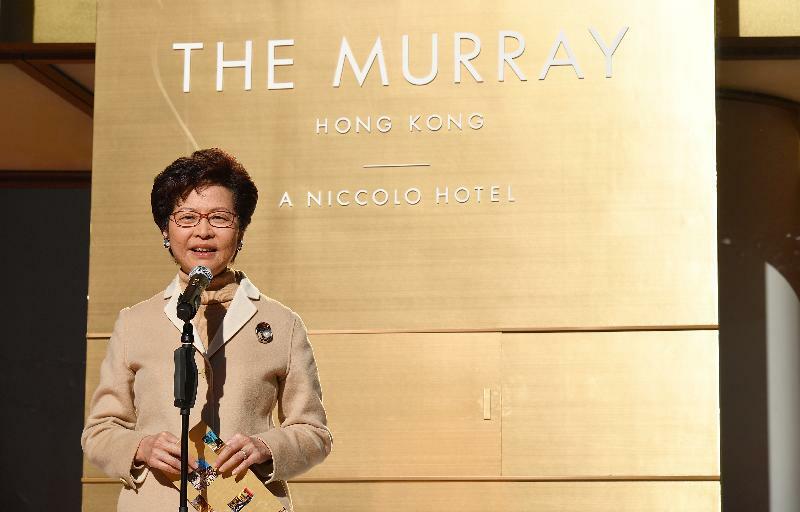 Ahead of us there are a lot of opportunities but also a lot of challenges, so I hope that all of you will work with me and my term of Government to re-invigorate the legend of Hong Kong, to bring Hong Kong to even greater and grander heights. And that's why these days, whenever I go out to promote Hong Kong, I said the best of Hong Kong has yet to come. Now, coming back to this Murray, this is a unique project amongst the eight projects in "Conserving Central", because of a number of reasons. First, it is the only commercial project because somehow, the Government is now quite worried of working with private sector partners. But for this one, it has to be a commercial project because I don't think this Government is good at running luxury hotels. So this is the only commercial project in "Conserving Central", whereas the others are either government project, or non-profit making projects. So I'm extremely pleased that this project, this commercial project, is not driven by profit. I can sense the passion put into this project by Peter, by Douglas, by the team. Just make sure you don't make the room rates too high, so that we as local residents also have a chance to come in to enjoy our former government office rooms. And also this is a unique project. The idea of conserving it into a hotel actually did not come from me. Like Peter, I was inspired by two incidents: one is a trip to Singapore. "Conserving Central" was announced in October 2009. I visited Singapore in the early part of 2009 to look at their conservation efforts and one of the projects they brought me to see was the Asia Insurance Building. It was built ten years earlier than The Murray, in 1955. It was slightly not as tall as Murray. It was a 20-storey building. Then, in the 1950s-1960s, was the tallest building in Singapore, now at Raffles Place. As a lot of high-rise buildings came into existence, this Asia Insurance Building is somehow dwarfed. It was sold off, and then rediscovered itself as a luxury residence building. It’s a service apartment so it’s very much like a hotel. And I was very impressed by that project. The second inspiration came from a man, I hope he is here, Mr Douglas Young of G.O.D. Douglas is over there. I'm sure you are all aware of the innovation of Douglas and G.O.D. Around that same time, when I was conceiving projects, on one day, there was a sort of newspaper publicity that came to my desk. It was not sent to me. Douglas knows very well where to send these innovative ideas. It was sent to my boss. But as usual, my boss always delegated things to me so it was landed on my desk with this wonderful idea of turning the Murray Building into a hotel. So thank you very much, Douglas. And the third uniqueness about Murray is the developer is required not only to preserve the building, but also to preserve the connectivity that this building is so strategically located: connecting to CGO through a subway; connecting to the now Champion Tower through a pedestrian bridge; and connecting to the Hong Kong Park and also to the Peak Tram Station. The third thing they need to conserve, with a bit of difficulty, is the tree - this Pink and White Shower. It's over 100 years old. In Chinese it's called 節果決明. As Peter has told you, this tree was almost certified dead by my colleagues in the LCSD. I said, I will not give up on this tree because I worked in this building and I love this tree. So I brought in a whole team of tree experts with the support of Chi Lin Nunnery. I'm sure for those of you who have visited Chi Lin, they are so good at horticultural preservation. Pro bono, they sent me a team to work on this tree for over a month in order to preserve it. I'm very pleased now this tree should be in very good condition and will become the landmark of the new Murray. This event to me is very much anticipated because in the last four, five years, I passed through this building every day, when I was heading back to Victoria House, or now heading back to Government House, so in a way, I've been monitoring the progress of the transformation of the Murray Building into The Murray. I want to take this opportunity to commend and thank Wheelock Holdings and the teams for a job very well done. I'm sure we'll be very proud of this project. Thank you very much.